The Periodic Chart of the Elements is just a way to arrange the elements to show a large amount of information and organization. As you read across the chart from right to left, a line of elements is a Period. As you read down the chart from top to bottom, a line of elements is a Group or Family. We number the elements, beginning with hydrogen, number one, in integers up to the largest number. The integer number in the box with the element symbol is the atomic number of the element and also the number of protons in each atom of the element. The periodic table is a way to organize the elements based on their similarities. The first version was constructed by Dmitri Mendeleev in 1869. He put the elements into a grid with increasing atomic weights and noticed the elements in each column had similar chemical properties. Mendeleev was able to predict the existence of elements before they were discovered or synthesized by looking at gaps in his table. However, he also found inconsistencies. 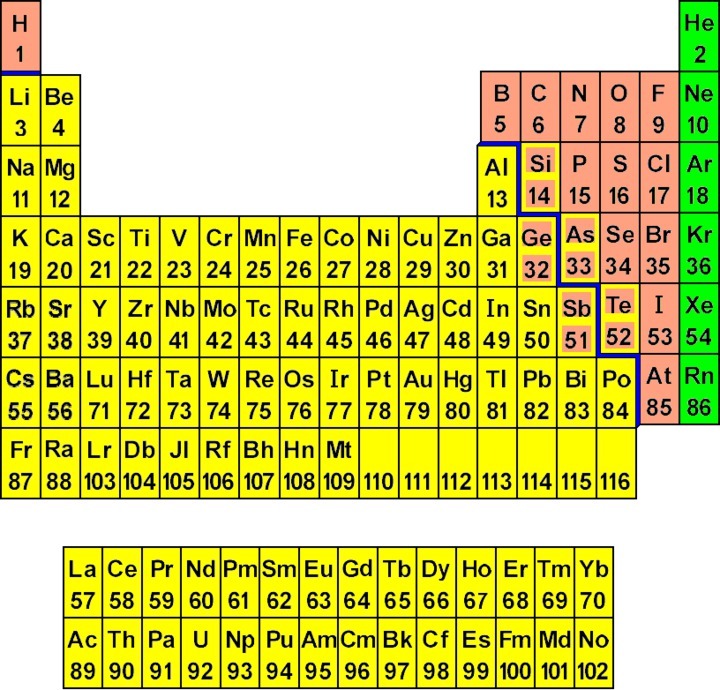 For example, according to Mendeleev’s table, Argon should have been placed before Potassium. The solution to this problem came in 1913 when Henry Moseley organized the elements by atomic number (the number of protons an atom has). He did this by shooting electrons at atoms and analyzing emission x rays. This new organization fixed all of the contradictions created by the the atomic weight organization. Below is a picture of the final result. The periodic table is structured in a way that is very useful for chemists. The horizontal rows are called periods. Typically the element’s symbol, atomic number, and atomic weight are shown. An element’s period tells us the highest unexcited energy level for an electron. We can tell the number of valence (outer) electrons as well as other useful properties an element has from its group number. This will be discussed more in the next section. The periodic table is also organized into four blocks according to the subshell in which the last electron resides. 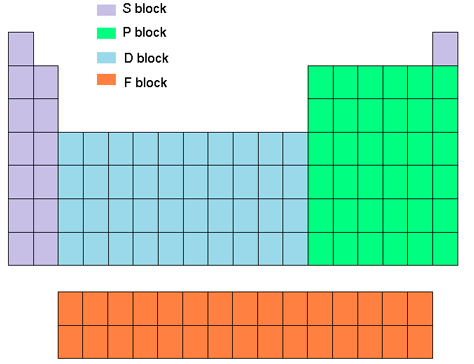 The s block contains the first two groups, the p block contains the last six groups, the d block contains groups 3 to 12, and the f block has the lanthanides and actinides usually located in two rows at the bottom of the period table. Blocks help when writing out the electron configuration of an element. A few points should be noted. Although helium is in group 18, it only has two valence electrons. Also, hydrogen is a nonmetal. In order to predict the number of valence electrons that transition metals have, other methods must be used. There are also specific trends that the periodic table follows. These deal with the size, ionization energy, electronegativity, and electron affinity of an element. The size (atomic radius) of an electron decreases from left to right. This is because each time a proton is added the electrons are drawn closer in towards the center. The atomic radius increases from top to bottom. The ionization energy of an element, or the amount of energy required to remove an electron increases from left to right and decreases from top to bottom. Electronegativity, the tendency of an element to attract electrons, follows the same pattern as ionization energy. Electron affinity also shows trends, but they are less consistent than the others. Electron affinity is the amount of energy released when an electron is added to a neutral atom to form a negative ion. It generally increases left to right and decreases top to bottom. One last major trend of the period table deals with the metallic character of an element. Elements with lower ionization energies, electron affinities, and electronegativity have stronger metallic characteristics. This means it decreases left to right and increases top to bottom which helps explain the staircase shape in many periodic tables that metalloids create. The periodic table is not set in stone. New elements will be discovered, and scientists are not sure whether or not the periodic table will continue with the current trends. Adjustments may need to be made. Also, the number of possible elements is debated. Current predictions range from 126 to 155 elements. Matter is anything that has mass and takes up space. It includes all the physical “stuff” around us—rocks, houses, water, air, people, ants, trees, etc. All matter can exist as a solid, a liquid, or a gas. Matter includes all the things we can weigh (to find the mass) and measure to find the volume (because they take up space). Different substances—different types of matter—have different properties that can be used to distinguish them from each other. These properties are things that you can observe or measure about the substance. For example, water and isopropyl alcohol (rubbing alcohol) are both clear, colorless liquids at room temperature. However, they can be told apart because they have other properties that are different. Water is odorless while the isopropyl alcohol has a strong smell. The alcohol evaporates very quickly while the water evaporates slowly. Also, the alcohol is flammable—it can be set on fire with a match (but don’t try this at home!). Water, on the other hand, is not only inflammable; it is used to put out fires. The properties of matter can be divided into two categories: physical properties and chemical properties. Physical properties can be observed or measured without changing the composition of the substance. An example is odor. When you smell water or isopropyl alcohol, neither of these substances changes into something else. They remain water and isopropyl alcohol. Similarly, when water and isopropyl alcohol evaporate, they do not change into something else. They move from liquid into gas, but the water is still water and the alcohol is still alcohol. Because these substances do not change into different substances, the properties of odor and speed of evaporation are physical properties. Here are some other examples of physical properties. Copper is a substance that is a solid metal at room temperature with a melting point of 1083°C. It is shiny, bendable, and orange-brownish-colored. It can be flattened into a very thin sheet of metal or it can be stretched into a thin wire. It can conduct heat quickly and it can conduct electricity, which is why copper is used in power cords and other wires. All of these properties of copper are physical properties because the copper does not change into anything else when these properties are observed. You can see that it is a solid and shiny without doing anything to it. You can bend, flatten, or stretch, it. These actions will change the shape and appearance, but it remains copper. Even heating it until it melts into a liquid or running electricity through it will not change the copper into another substance. As mentioned above, some properties are chemical instead of physical properties. In this type, the substance actually changes into another kind of substance. The flammability of isopropyl alcohol is an example of a chemical property. When alcohol is burned, the alcohol actually turns into something else. At the end of the change, the alcohol is gone and has been replaced by carbon dioxide (a colorless gas) and water vapor (water that is in the gas state). This is not a physical property because the isopropyl alcohol is changed into something else. Chemical properties are observable characteristics of the makeup of a substance. Observable does not necessarily mean that one can visually see it; rather it means that we can note the result. We can observe a smell, a voltage, or even a time. Chemical properties are observable characteristics of the makeup of a substance. We find out that Silver (Ag) reacts with elemental Oxygen (O2) to form Silver Oxide Ag2O. If this necklace were actually plated with silver instead of being made out of silver we would expect a different result than what we observe with pure silver. One element that we have an abundance of in our atmosphere is Oxygen (O2), so we could do a lot of tests it. We leave the necklace in a bottle and fill it with pure O2. After some time, we see that the necklace has reacted. We take out the necklace and analyze the chemical composition of the result; we find that we have a good amount of Silver Oxide (Ag2O) present. Great, chemical properties have helped us solve the mystery of the shiny necklace, but too bad we no longer have our necklace. That’s a main point that I should tell you, in the process of observing chemical properties we often must alter the chemical composition of the original substance to obtain the property. With this said, make sure not to go and react your mom’s necklace without letting her know, because the reaction is often irreversible! Now that we learned what chemical properties are, let’s get back to basics “The Periodic Table of Elements.” Of course there are many ways that we can classify these elements, we can classify them according to size, color, smell, behavior, or even by the way they react with water. Chemists have determined that the best way to organize the elements is to align them into vertical columns (“groups” or “families”) and then to further classify them into regions based on their behavior. All of these elements are metals and exist as solids at room temperature. These elements are extremely reactive, due to their valence shell containing only 1 electron. They all react with water to produce hydrogen and alkaline solutions. In case you’re wondering, alkaline solutions are mixtures of a basic solid dissolved in water. Being that these elements absolutely hate being alone, we always find these elements reacted with another element in nature. An example of this is sodium chloride (NaCl). Just like Group 1A metals, these elements (with the exception of Be) react with water to produce alkaline solutions. Many times these elements are found as their cousin oxides, such as Calcium Oxide (CaO), in which case they still react with water to produce alkaline solutions. Magnesium and Calcium are the earth’s seventh and fifth most abundant crust constituent. No wonder they are called “earth metals”. The main similarity of these elements is that they all form compounds with analogous formulas. What does that mean? Well if we take Boron (B) and mix it with abundance with Chloride (Cl), we end up with BCl3. Ok, I agree, not too interesting; but, what if we take another element of group 3A...how about Aluminum (Al). If Aluminum is mixed with an abundance of Chloride we get (drumroll please) AlCl3. This is pretty extraordinary, so because of this we can claim they are all a family and react similarly. Starting with this group and moving to the right, we start to see more and more nonmetals present in each family. In this family, Carbon (C) is a nonmetal, Silicon (Si) and Germanium (Ge) are metalloids, Tin (Sn) and lead (Pb) are metals. It becomes apparent that families are becoming more diverse moving to the right. Since this family, 4A, happens to be very diverse, more variation occurs in the properties of this group. Just as in group 3A, all of these elements happen to form similar compounds such as CO2, SiO2, GeO2, SnO2, and PbO2. Again, we see a metal mixed with a nonmetal and a metalloid in this family...it appears that there probably won’t be that many properties that these elements share. It turns out that these elements are grouped together because they all form similar compounds. An example is in the case of Oxides, N2O5, P2O5, and As2O5. Like our families at home, group 6A is a very diverse family of elements. These elements don’t have a whole lot in common, but then again what do you really have in common with your parents?. All elements in group 6A form similar Oxygen containing compounds SO2, SeO2, and TeO2. Interestingly, they all form similar sodium containing compounds as well, Na2O, Na2S, Na2Se, and Na2Te. This entire group is formed of nonmetals indicating that we are likely to find a lot of similarities within this family. All of the halogens exist as diatomic molecules in nature, are extremely reactive (the most reactive of all the elements, in fact), and they all react extremely violent with the alkali metals to form salts. Enjoy your table salt (NaCl) because sodium reacted pretty violently with Chloride to form this. The good old noble gases! Where would we be today without some helium balloons for your birthday or no neon light up signs? All of these gases are extremely rare on earth and therefore were not discovered until late 19th century. These elements absolutely hate to react with other elements. They prefer to be as isolated as possible because, after all, they are noble. 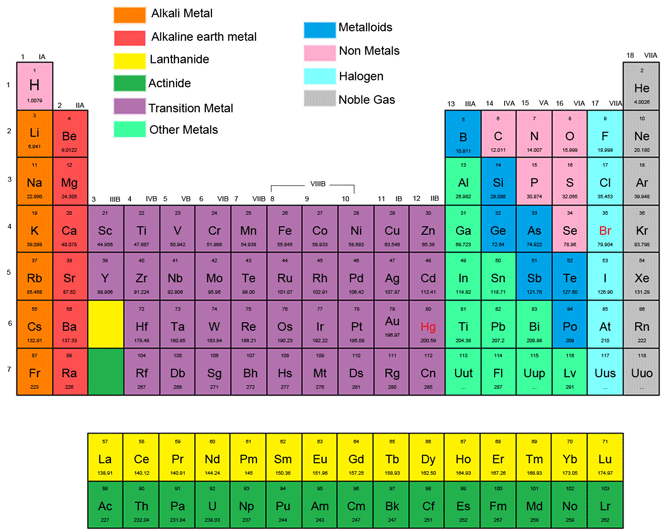 All of these elements are metals, hence the name transition metals. It’s hard to find similar properties in these groups so we will leave them alone for now. The main classification that all these elements share is their unfilled d-subshell. We didn’t talk too much about quantum numbers, but you will soon see how valence shells can affect the behavior of elements and how they react. So let’s all give a round of applause for Dmitri Ivanovitch Mendeleev and his organization of the modern day Periodic Table of Elements. Mendeleev saw that elements possess similar characteristics (properties) if looked at by a function of their atomic number. This became known as “The law of chemical periodicity” it’s pretty obvious why. This law states that the properties of elements are functions of the atomic number of the element, WOW! Even more interesting, a lot of the elements were not even discovered when he made the first periodic table of elements, so he actually left spots in his original table for “possible elements” that he believed would be discovered in the future. Now that’s cool! It turns out that chemistry is filled with tons and tons of chemical properties. Some properties are shared between substances and some are not. It turns out that there are so many different chemical compositions in our universe that it would be impossible to approach each separately. Luckily for us, chemists have taken individual compounds and grouped them into different classes that each share similar chemical properties. Let’s talk about a few. An alcohol is any organic compound that contains a hydroxyl group attached to a carbon. As you can imagine, there is a huge number of ways that one can attach a hydroxyl group to a carbon atom. There are so many ways that chemists realized, it’s probably smarter to just classify them all as types of alcohols. All alcohols share some common chemical properties, for instance upon reacting an alcohol with O2 (also known as a combustion reaction) we will always get carbon dioxide (CO2) and water (H2O). Another interesting property is alcohol’s ability to be oxidized. Alcohols can be oxidized into carboxylic acids with the usage of oxidizing agents such as potassium dichromate (VI) or potassium manganite (VII). By the way, this is the reason wine turns sour if left in the presence of oxygen. We can go on and on about the chemical properties of various classes, but the main point of this article is to get you acquainted to what a chemical property is. So what? I know what a chemical property is, how does that help me? Well, just like identifying your friends by their respective names, just like being able to tell the difference between day and night, and just like being able to differentiate between hot and cold, as maturing chemists we need the ability to identify a substance and set it apart from every other substance in the universe! We can’t go around claiming ethanol is the same as water just because they share the same property of color. We can’t breathe in carbon monoxide (CO) instead of Oxygen (O2) because they both are odorless. The more chemical properties we know about a certain type of matter, the better we can differentiate that substance from every other substance in our universe! Which of these is not a physical property of water? The correct answer here would be C.
The water is turning into oxygen and hydrogen; therefore, the chemical makeup is changing due to it breaking apart. After the process described, it is no longer water. Which of these is a physical property of the metal aluminum, out of which aluminum foil is made? A. Aluminum foil can be crumpled into a ball. B. Aluminum can be corroded by oxygen to form aluminum oxide. C. Aluminum can be "destroyed" by hydrochloric acid (HCl), forming aluminum chloride and hydrogen gas. The correct answer here would be A. The aluminum is only changing shape; in the other choices, the aluminum is changing into other substances. True or false? When water is heated to its boiling point of 100°C, it bubbles and appears to disappear into the air. This is an example of a physical property. Which of the following is a chemical property? C. A carboxylic acid is formed with the reaction of an alcohol with oxygen. Why do we identify substances by their properties? B. To differentiate that substance from other substances. C. To help us learn more about matter. The correct answer here would be D.
How can we tell the difference between water and ethanol? C. by reacting them with oxygen. What is the definition of chemical periodicity? A. Properties of elements are functions of mass number. B. Properties of elements are functions of period. C. Properties of elements are function of atomic number. Which of the following would react with water to form hydrogen and alkaline solution? The periodic chart came about from the idea that we could arrange the elements, originally by atomic weight, in a scheme that would show similarity among groups. The original idea came from noticing how other elements combined with oxygen. Oxygen combines in some way with all the elements except the inert gases. Each atom of oxygen combines with two atoms of any element in Group 1, the elements in the row below lithium. Each atom of oxygen combines one-to-one with any element in Group 2, the elements in the row below beryllium. The group of transition elements (numbers 21-30 and 39-48 and 71-80 and 103 up) have never been adequately placed into the original scheme relating to oxygen. The transition elements vary in the ways they can attach to oxygen, but in a manner that is not so readily apparent by the simple scheme. Group 3 is the group below boron. All of these elements combine with oxygen at the ratio of three to two oxygens. Group 4, beginning with carbon, combines two to one with oxygen, etc. Gallium, element number thirty-one, is the crowning glory of the Periodic Chart as first proposed by Mendeleev. Dmitri Ivanovich Mendeleev first proposed the idea that the elements could be arranged in a periodic fashion. He left a space for gallium below aluminum, naming it eka- aluminum, and predicting the properties of gallium fairly closely. The element was found some years later just as Mendeleev had predicted. Mendeleev also accurately predicted the properties of other elements. Most Periodic Charts have two rows of fourteen elements below the main body of the chart. These two rows, the Lanthanides and Actinides really should be in the chart from numbers 57 - 70 and from 89 - 102. To show this, there would have to be a gulf of fourteen element spaces between numbers 20 - 21 and numbers 38 - 39. This would make the chart almost twice as long as it is now. The Lanthanides belong to Period 6, and the Actinides belong to Period 7. In basic Chemistry courses you will rarely find much use for any of the Lanthanides or Actinides, with the possible exception of Element #92, Uranium. No element greater than #92 is found in nature. They are all man-made elements, if you would like to call them that. None of the elements greater than #83 have any isotope that is completely stable. This means that all the elements larger than bismuth are naturally radioactive. The Lanthanide elements are so rare that you are not likely to run across them in most beginning chemistry classes. Another oddity of the Periodic Chart is that hydrogen does not really belong to Group I -- or any other group. Despite being over seventy percent of the atoms in the known universe, hydrogen is a unique element. Atoms, and their subatomic particles, are measured in a.m.u., or atomic mass units. An atomic mass unit is the equivalent of 1/12 of the mass of a carbon-12 atom. Elements are most often measured in a.m.u., grams, or moles. Each of these measurements will be further explained in the following pages, as needed. Symbol: This is often a one or two letter abbreviation for the element; for example, carbon’s symbol is C. When writing the symbol, the first letter is always capitalized, and if it has a second letter, it is lower-case. Element name: This is what the element is called. Some periodic tables have both the symbol and the name, while others just have the symbol, so it is important to know both. Atomic Number: This is the number of protons the element contains. For example, carbon’s atomic number is 6, because there are 6 protons in a carbon atom. Atomic Weight: This is often the decimal number given, and it is usually in units of grams/mol. This number will be used greatly in gram to mol conversions later on. For example, carbon’s atomic weight is 12.011 g/mol. Atomic Mass Number: This is a whole number that is usually very close to the atomic weight. The atomic mass number is the number of protons plus the number of neutrons in an atom. For example, carbon’s atomic mass number is 12, which means it has 6 protons and 6 neutrons. This is helpful in calculating mass ratios. For every element there is one and only one upper case letter. There may or may not be a lower case letter with it. When written in chemical equations, we represent the elements by the symbol alone with no charge attached. The seven exceptions to that are the seven elements that are in gaseous form as a diatomic molecule, that is, two atoms of the same element attached to each other. The list of these elements is best memorized. They are: hydrogen, nitrogen, oxygen, fluorine, chlorine, bromine, and iodine. The chemical symbols for these diatomic gases are: H2, N2, O2, F2, Cl2, Br2, and I2. Under some conditions oxygen makes a triatomic molecule, ozone, O3. Ozone is not stable, so the oxygen atoms rearrange themselves into the more stable diatomic form. The diatomic gases (hydrogen, nitrogen, oxygen, fluorine, chlorine, bromine, and iodine), the Group one elements (lithium, sodium, potassium, rubidium, cesium, and francium), the Group two elements (beryllium, magnesium, calcium, strontium, barium, and radium), Group seven elements, the halogens, (fluorine, chlorine, bromine, iodine, and astatine), and the noble gases (helium, neon, argon, krypton, xenon, and radon). If nothing else, learning these as a litany will help you distinguish between radium, a Group 1 element, and radon, an inert gas. Groups of two or more element symbols attached to each other without any charge on them indicate a compound. CaCl2 is a compound with two chlorine atoms for each calcium atom. CuSO4 · 5H2O, cupric sulfate pentahydrate, is also a compound. It has one copper atom and one sulfate ion consisting of a sulfur atom and four oxygen atoms attached to five molecules of water. Charged particles, called ions, when written with symbols will have the charge, either positive (+) or negative (-), written to the right and superscripted to the chemical symbol. For instance, Na+ is the symbol for the sodium ion. Atoms or polyatomic ions with charges of more than one, either positive or negative, have a number with the charge. For instance (CO3)2- is the symbol for the carbonate ion. The carbonate ion has one carbon atom in it, three oxygen atoms, and a charge of negative two. Observe that the charge is outside the parentheses, indicating that the charge is from the polyatomic ion as a whole. All naturally occurring atoms (of the elements listed on the periodic table) are made up of neutral atoms, meaning they have the same number of protons and electrons. An imbalance of protons and electrons creates an ion, an atom that contains more protons than electrons, or vice versa. Ions are created by the gain or loss of electrons. Gaining an electron would give an ion a negative charge, because electrons make the atom more negative. Losing an electron would give the ion a positive charge, because taking away the electron (which is negative) would make the atom more positive. A positive ion is called a cation, and it can have a +1, +2, or +3 charge. A negative ion is called an anion, and it can have a -1, -2, or -3 charge. Sometimes the charges may be higher than positive or negative 3, but generally they are either + or – 1, 2, or 3. Isotopes are also important when determining mass and charge. Some elements have isotopes, which means that they have different types of atoms—some of which have more neutrons than others. Now remember, neutrons do not have a charge, so an isotope does not have a different charge than that of the original elemental atom, it simply has a different number of neutrons, which changes the atomic mass slightly. For example, the most often occurring form of carbon is carbon-12, which means that that form of carbon has 6 protons, 6 electrons, and 6 neutrons. However, some common isotopes of carbon are carbon-13 and carbon-14, which can be interpreted as follows: carbon-13 would have 6 protons and 6 electrons (as usual) but this isotope would have 7 neutrons, as 13 – 6 = 7. Carbon-14 would have 6 protons and 6 electrons, as usual, but this isotope would have 8 neutrons, as 14 – 6 = 8. Sometimes, compounds can be ions as well. Remember, we said ions were elements with a positive or negative charge. Well, ions can be made up of compounds as well. For example, NO3- is the negative nitrate ion that bonds with hydrogen to form HNO3. Ions that are compounds are called polyatomic ions, because they are made up of more than one atom of elemental material. What Wyzant calls 'categories of elements' include; metals, non-metals, semi-metals, noble gases, and hydrogen. Consider a staircase-shaped line on the Periodic Chart starting between boron and aluminum turns to be between aluminum and silicon then down between silicon and germanium, between germanium and arsenic, between arsenic and antimony, between antimony and tellurium, between tellurium and polonium, and between polonium and astatine. This is the line between metal and non-metal elements. Metal elements are to the left and down from the line and non-metal elements are to the right and up from the line. Well, that's not exactly true. There is a line of non-metal elements, Group 8, or Group 18, or Group 0, whichever way you count them, the noble or inert gases that are really an entire Group and category to themselves. Hydrogen is a unique element, the only member of its own Group and category. The noble gases, or inert gases, have the following properties: For the most part, they do not make chemical combinations with any elements. There have been some compounds made with the noble gases, but only with difficulty. There are certainly no natural compounds with this group. They are all gases at room temperature. They all have very low boiling and melting points. They all put out a color in the visible wavelengths when a low pressure of the gas is put into a tube and a high voltage current is run through the tube. This type of tube is called a neon light whether the tube has neon in it or not. The inert gases are non-metals because they are not metals, but they are significantly different from the other non-metals. As closely akin as all the noble gases are to each other, they should surely be considered a separate group. 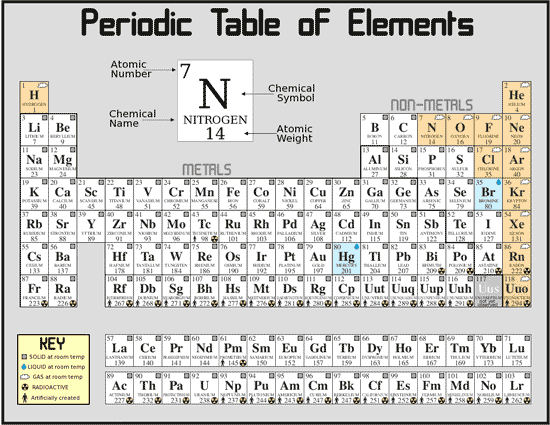 By far the largest category of elements on the Periodic Chart is the metal elements. Metals share a set of properties that are not as universal to them as the inert gases. Metal elements usually have the following properties: They have one, two, or three electrons on the outside electron shell. The outside electrons make it more likely that the metal will lose electrons, making positive ions. The ions of metals are usually plus one, plus two, or plus three in charge. Metals tend to lose electrons to become stable. They will attach to other elements with ionic bonds almost exclusively. When metal atoms are together in a group, there is a swarm of semi-loose electrons around the atoms. These electrons move about freely among the metal atoms making what is called an electron gas. The electron gas accounts for the shininess of metals. When there is a smooth surface on the metal it will reflect electromagnetic waves (to include visible light) in an organized manner. The shininess is also called metallic luster. The same electron gas accounts for the cohesive tendencies of metals. Cohesive means the material clings to itself. This property can be easily seen with mercury. Mercury atoms cling to other mercury atoms or other metal atoms with an incredible tenacity. This same cohesion of metals occurs in the solid state. Silver is very malleable. That means that if you hit it, the material would more likely change shape than shatter. At one time US half dollar coins were made of ninety percent silver. It is illegal to deface money, but school children would take a spoon and beat the sides of the silver half dollars until the edges curled inward. When the center became the right size, it was taken out to make a silver ring beaten to fit your finger. Wire is made by pulling metals through a die. The metal coheres to itself so much that it will reshape itself to the shape of the die as it passes through the hole in the die. This property of being able to be pulled through a die to make wire is called ductility (from Latin ducere, to pull or to lead). The presence of the electron gas makes metals good conductors of electricity. Again due to the cohesive property, metals have high melting and boiling points. Almost all metals are solids at room temperature. Metals are usually good conductors of heat. Active metals react with acids. Some very active metals will react with water. Metal elements tend to be denser than non-metals. Non-metals usually have four, five, six, or seven electrons in the outer shell. When they join with other elements non-metals can either share electrons in a covalent bond or gain electrons to become a negative ion and make an ionic bond. When non-metal elements join by covalent bonds, it is usually to other non-metals. Non-metals can attach together with covalent bonds to make a group of (usually non-metal) elements with a common charge called a radical or polyatomic ion. Elemental non-metals often have a dull appearance. They are more likely to be brittle, or shatter when struck. Although not a constant rule, non- metals tend to have lower melting and boiling points than metals and the solids tend to be less dense. Non-metals are not as cohesive as metals and certainly not ductile. Non-metals are not usually good conductors of heat or electricity. Many non-metals form diatomic or polyatomic molecules with other atoms of the same element. We have pretended that there is a sharp dividing line between the metals and non-metals. This is not the case. The staircase-shaped line between metals and non-metals has several elements on or near it that have properties somewhere between the two categories. By having three electrons in the outside shell, boron should be a metal element. It is not. Boron is more likely to form covalent bonds like a non-metal than donate electrons like aluminum, the next element down the chart in the same group. Aluminum is definitely a metal in most of its traits, but it has its own idiosyncrasy. Aluminum is amphoteric; it reacts with both acids and bases. Silicon, germanium, arsenic, antimony, and tellurium are on the line between metals and non-metals and exhibit some of the qualities of both. These elements do not really comprise a clear-cut category, but, due to the mix of properties they show, they are often lumped into a classification called semi-metals. Many of the elements on the line are semiconductors of electricity, meaning that they have the ability to conduct electricity somewhere between almost none and full conduction. This property is useful in the electronics industry. We have failed to include hydrogen in any of the categories, for good reasons. Hydrogen just does not match anything else. More than ninety-nine-point-nine percent of hydrogen is just one proton and one electron. A very small proportion (one atom in several thousand) of hydrogen is deuterium, one proton, one neutron, and one electron. An even smaller portion (one hundred atoms per million billion) of hydrogen is tritium, one proton, two neutrons, and one electron. When a hydrogen atom gains an electron, it becomes a negative ion. The negative hydrogen ion, called hydride ion, can be attached to metals, but it is not seen in nature because it is not stable in water. The positive hydrogen ion is what is responsible for acids. There really is no such thing as a (positive) hydrogen ion. Having only a proton and an electron, hydrogen becomes only a proton if it loses its electron. Loose protons attach themselves to a water molecule to make H3O+ ion, a hydronium ion. This hydronium is the real chemical that produces the properties of acids. Elemental hydrogen is a diatomic gas. Except for having a valence of +1, hydrogen has few other similarities with the Group 1 elements. Hydrogen makes covalent bonds between other hydrogen atoms or other non-metals. Group I (1) elements, lithium, sodium, potassium, rubidium, cesium, and francium, are also called the alkali metal elements. They are all very soft metals that are not found free in nature because they react with water. In the element form they must be stored under kerosene to keep them from reacting with the humidity in the air. They all have a valence of plus one because they have one and only one electron in the outside shell. All of the alkali metals show a distinctive color when their compounds are put into a flame. Spectroscopy (dividing up the spectrum so you can see the individual frequencies) of the colored light from the flame test shows strong emission lines from the elements. The lightest of them are the least reactive. Activity increases as the element is further down the Periodic Chart. Lithium reacts leisurely with water. Cesium reacts very violently. Very few of the salts of Group 1 elements are not soluble in water. The lightest of the alkali metals are very common in the earth's crust. Francium is both rare and radioactive. Group II (2) elements, beryllium, magnesium, calcium, strontium, barium, and radium, all have two electrons in the outside ring, and so have a valence of two. Also called the alkaline earth metals, Group 2 elements in the free form are slightly soft metals. Magnesium and calcium are common in the crust of the earth. Group 3 elements, boron, aluminum, gallium, indium, and thallium, are a mixed group. Boron has mostly non- metal properties . Boron will bond covalently by preference. The rest of the group are metals. Aluminum is the only one common in the earth's crust. Group 3 elements have three electrons in the outer shell, but the larger three elements have valences of both one and three. Group 4 elements, carbon, silicon, germanium, tin, and lead, are not a coherent group either. Carbon and silicon bond almost exclusively with four covalent bonds. They both are common in the earth's crust. Germanium is a rare semi-metal. Tin and lead are definitely metals, even though they have four electrons in the outside shell. Tin and lead have some differences in their properties from metal elements that suggest the short distance from the line between metals and non-metals (semi-metal weirdness). They both have more than one valence and are both somewhat common in the crust of the earth. Group 5 is also split between metals and non-metals. Nitrogen and phosphorus are very definitely non-metals. The element nitrogen as a diatomic molecule forms about eighty percent of the atmosphere. In the rare instances that nitrogen and phosphorus form ions, they form triple negative ions. Nitride (N-3) and phosphide (P-3) ions are unstable in water, and so are not found in nature. All of the Group 5 elements have five electrons in the outer shell. For the smaller elements it is easier to complete the shell to become stable, so they are non-metals and are more likely to form covalent bonds than ionic bonds. The larger elements in the group, antimony and bismuth, tend to be metals because it is easier for them to donate the five electrons than to attract three more. Arsenic, antimony and bismuth have valences of +3 or +5. Arsenic is very much a semi-metal, but all three of them show some semi-metal weirdness, such as brittleness as a free element. Group VII (6 or 16) elements, oxygen, sulfur, selenium, and tellurium, have six electrons in the outside shell. We are not concerned with polonium as a Group 6 element. It is too rare, too radioactive, and too dangerous for us to even consider in a basic course. Tellurium is the only element in Group 6 that is a semi-metal. There are positive and negative ions of tellurium. Oxygen, sulfur, and selenium are true non-metals. They have a valence of negative two as an ion, but they also bond covalently. Oxygen gas makes covalent double-bonded diatomic gas molecules that are about twenty percent of the earth's atmosphere.. Oxygen and sulfur are common elements. Selenium has a property that may be from semi-metal weirdness; it conducts electricity much better when light is shining on it. Selenium is used in photocells for this property. On some charts you will see hydrogen above fluorine in Group VII (7 or 17). Hydrogen does not belong there any more than it belongs above Group 1. Fluorine, chlorine, bromine, and iodine make up Group 7, the halogens. We can forget about astatine. It is too rare and radioactive to warrant any consideration here. Halogens have a valence of negative one when they make ions because they have seven electrons in the outer shell. They are all diatomic gases as free elements near room temperature. They are choking poisonous gases. Fluorine and chlorine are yellow-green, bromine is reddish, and iodine is purple as a gas. All can be found attached to organic molecules. Chlorine is common in the earth's crust, much of it as the negative ion of salt, NaCl, in the oceans. Fluorine is the most active of them, and the activity decreases as the size of the halogen increases. The inert gases or noble gases all have a complete outside shell of electrons. Helium is the only one that has only an "s" subshell filled, having only two electrons in the outer and only shell. All the others, neon, argon, krypton, xenon, and radon, have eight electrons in the outer shell. Since the electron configuration is most stable in this shape, the inert gases do not form natural compounds with other elements. The group is variously numbered as Group VIIIA, 8, 8A, 0, or 18. 'Group zero' seems to fit them nicely since it is easy to think of them as having a zero valence, that is no likely charge. The Transition Elements make up a group between what Chemtutor has labeled Group 2 and Group 3. 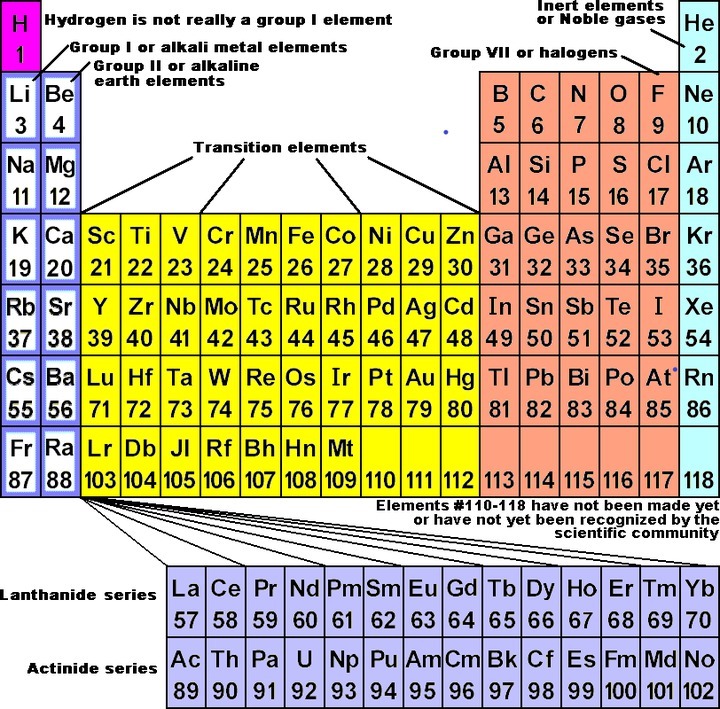 Transition elements are all metals. Very few of the transition elements have any non-metal properties. Within the transition elements many charts subdivide the elements into groups, but other than three horizontal groups, it is difficult to make meaningful distinctions among them. The horizontal groups are: iron, cobalt, and nickel; ruthenium, rhodium, and palladium; and osmium, iridium, and platinum. Iron is thought to be plentiful as a molten mass in the center of the earth. Lanthanides and actinides are called the Inner Transition Elements. Lanthanides, elements 57 through 70, are also called the rare earth elements. They are all metal elements very similar to each other, but may be divided into a cerium and a yttrium group. They are often found in the same ores with other elements of the group. None are found in any great quantity in the earth's crust. Of the Actinides, elements 89 through 102, only the first three are naturally occurring, the rest being manufactured elements. Of the three naturally occurring ones, only uranium is likely to be referred to in any way in a basic chemistry course. Elements 103 through 109 have been manufactured, and they have been named by the IUPAC (International Union of Pure and Applied Chemistry), but they are not of much importance to this course. Sign up for free to access more Science resources like . Wyzant Resources features blogs, videos, lessons, and more about Science and over 250 other subjects. Stop struggling and start learning today with thousands of free resources!